Everest Base Camp Trek is one of the most famous trekking destinations in the world. The trail is moderate in terms of difficulty and presents the heart-warming views of the Himalayas and its glorious landscapes. Not to mention, every year hundred even thousands of travel enthusiasts from all around the globe visit this place. Trek to Everest Base Camp will let you witness panoramic views of Mt. Everest (8,848 m), Mt. Ama Dablam (6,812 m), Mt. Lhotse (8,516 m), Mt. Nuptse (7,816 m), Island Peak (6,189 m), and many other mountains. Not only these, but you will also get to see the highest glacier of the world, the Khumbu Glacier. The trail will include several ascends and descends, beautiful rhododendron & pine forests, numerous small picturesque villages, streams, and small gompa. The trek will not only offer views of snow-capped mountains but also provide an opportunity to experience the lifestyle, culture, and tradition of the people residing in this extreme region. You will reach Tengboche where you will get to see the biggest and oldest monastery of the Khumbu Region. We also have an option for you, after completing the trek, you can also return by Helicopter and see the view of the entire Khumbu region with birdseye perspective. Everest Base Camp Trek and return by helicopter package will be best alternatives if you have limited time. Moreover, if you have some extra days on your hand, you can also do our famous Gokyo Chola Pass Trekking or Three High Passes Trekking. Be a part of this adventurous journey with our company. We are a team of experts and believe in providing eco-friendly packages to our clients. We also customize an itinerary according to the need and time of our clients. We will make sure that, with us, you are enjoying every second of this trip without having any problem. What are the accommodation and food during the Everest Base Camp Trek? You will stay in the two-three star hotel in Kathmandu. During the trek, you will stay in the lodge. All the accommodation are on a twin-sharing basis. On prior request, a single room can be arranged in Kathmandu but, it might not be available during the trek. Also, note that all the lodges might not have separate washrooms. You will get breakfast, welcome dinner, and farewell dinner in Kathmandu. During the trek, meals will be served as per the menu of the lodge/guest house. You can get boiled water easily in the lodge/guest house and can fill every time when your bottle gets empty. We request you not to buy mineral water bottle during the trek as it will help immensely to preserve the region. For extra safety, you can carry water purification tablets with yourself. Is Everest Base Camp Trek is difficult? Everest Base Camp Trekking is a moderate trek. The trail is not so difficult in terms of technical climbing but, you have to walk around 5-7 hours or more than that per day. So you have to be passionate to walk long hours. Moreover, trekking to a higher altitude always required average physical fitness and sting determination. If you have any prior hiking or trekking experience it would be great but, it's not mandatory to go on Everest Base Camp Trek. We also request you to inform us about any past medical history so that we can give you the best option during the trek. What is the best time to go on the Everest Base Camp Trek? The best time to go on the Everest Base Camp Trek is from March-May and September-December. During this time of the year, the weather is generally clear and presents the best views of the region. Whereas during the Monsoon (June to mid-September) the region receives heavy rainfall that makes the trail slippery and views unclear. Similarly, in winter, the region receives heavy snowfall making the climate extremely cold and harsh. One potter between two people. No any meal and accommodation. Day 01Flight from Kathmandu to Lukla, then trek to Phakding (2,652 m): 3-4 HoursWe will wake up early and move to the airport after for our flight to Lukla. Lukla airport is known as the second most dangerous airport in the world, so no doubt we will going to have one of the most thrilling flights of our life. Upon reaching Lukla, we will see the change in scenery and the Himalayan landscape becomes quite prominent along with stimulating freshness in the air. We will begin trekking through a forested trail to reach the Cheplung village. From here, we will descend to the Dudh Koshi River Valley where Phakding village is located. Phakding will welcome us with the glimpse of Mt. Kusum Kanguru (6,367 m). Day 02Trek from Phakding to Namche Bazaar (3,440 m): 5-4 HoursAfter having a warm breakfast, we will begin trekking on the main trail that will take us to Namche Bazar, the biggest Sherpa village in the Khumbu region. On the way, we will go through small villages like Jorsale and Monjo. Moreover, Monjo is the entry point of the Sagarmatha National Park, and we will trek through the national park, which increases our chances of coming across wildlife. The trail will include pristine rivers, alpine woods, small streams, and forests of pine & cedar. Day 03Namche: Acclimatization and Rest DayIt is going to be our rest day so that our body can get acclimatized with the altitude that we have gained in the past few days. We will begin our day with a delicious breakfast. After that, we will hike to Syangboche Airstrip from where we will get to see the entire view of Namche Bazar as well as snow-capped mountains. Further, we will hike to the famous Everest View Hotel, which offers a wonderful view of Mt. Everest (8,848 m) and other Himalayan mountains. Later that day, we will visit the Everest Photo Gallery and Sherpa Culture Museum. Day 04Trek from Namche to Tengboche (3,800 m): 5-6 HoursWe will trek towards Dudh Koshi Valley at the village of Phungki Thanka. From here, we will trek along the right side of Dudh Koshi River and reach Tengboche village. Tengboche is located at the confluence of Dudh Koshi River and Imja Khola. Tengboche is a beautiful village surrounded by high hills, which are covered with gorgeous rhododendron bushes. Here, we will visit Tengboche monastery, one of the biggest and oldest monasteries of the Khumbu region. We will get to see stunning views of Mt. Everest (8,848 m), Mt. Ama Dablam (6,812 m), Mt. Lhotse (8,516 m), and many other mountains. Day 05Trek from Tengboche to Dingboche (4,360 m): 6-7 HoursToday, we will cross Imja River over a suspension bridge and continue our trek towards Dingboche. We will come across Pangboche village. From here, we will trek through forested trail and reach Dingboche, the Summer Valley of the Khumbu region. We will get to see striking views of Mt. Lhotse (8,516 m), Mt. Ama Dablam (6,812 m), Island Peak (6,189 m), and many other snow-capped mountains from here. Day 06Rest day Dingboche (4,360 m)It is our second rest day. We will spend the day exploring the village and its nearby areas. After having breakfast, we will hike to a hilltop located at 5,100 meters above Dingboche at the edge of Chhukung village. The hike will be steep and demands little more energy. From the top, we will get to see outstanding views of Kangtega (6,782 m), Taboche Peak (6,542 m), Lobuche East (6,119 m), Lobuche West (6,145 m), Ama Dablam (6,812 m), and Thamserku (6,623 m). If weather will be clear then we will also get to see the stunning view of Mt. Makalu (8,481 m), the fifth highest mountain in the world. After spending some at the top, we will return back to Dingboche to spend our night. Day 07Trek to Lobuche (4,940 m): 5-6 HoursWe will trek and reach Dhungla. From here, the trail will take us to Pheriche where we will come across Trekkers Aid Post, which is run by Western Volunteer Doctors and assisted by The Himalayan Rescue Association. Further, the trail will take us to Chupki Lhara and descend down to Khumbu glacier moraine. We will get to see views of mountains like Mt. Pumori (7,161 m), Mt. Lingtren (6,749 m), and numerous mountains along the way. After we will cross the glacier, we will get to see the view of Mt. Nuptse. Day 08Trek from Lobuche to Gorakshep (5,150 m) to Everest Base Camp (5,364 m), back to Gorakshep: 7-8 HoursHere comes the most awaiting day of our trip. Today, we will wake up early and have breakfast. After that, we will begin walking gradually along the side of the Khumbu Glacier. After trekking for around 2 to 3 hours, we will reach Gorakshep, which used to be the initial base camp of Mt. Everest. From here, we will ascend all the way up to an edge where Everest Base Camp is situated. 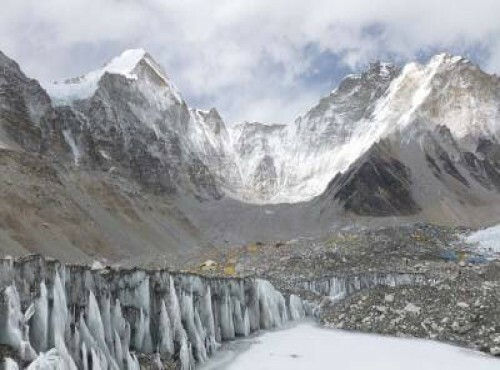 From base camp, we will get to see breath-taking views of the Khumbu Icefall, Mt. Everest (8,848 m), Mt. Lhotse (8,516 m), Mt. Nuptse (7,861 m), Mt. Lingtren (6,749 m), and many others. After spending some time at the Everest Base Camp, we will return back to Gorakshep where we will spend the night. Day 09Trek from Gorakshep to Kala Patthar (5,545 m) to Pheriche (4,280 m): 7-8 HoursWe will wake up early in the morning and begin trekking towards Kala Patthar. Kala Patthar is a viewpoint from where we will get to witness 360-degree views of Mt. Everest (8,848 m) along with captivating views of Nuptse (7,861 m), Lhotse (8,516 m), Ama Dablam (6,812 m), Pumori (7,161 m), Thamserku (6,623 m), and many other Himalayan mountains. Upon reaching Kala Patthar, we will get to see astonishing sunrise amidst the Mt. Everest and other mountains. After spending some time at the Kala Patthar, we will return back to Gorakshep and descend down to Pheriche where we will spend our night. Day 10Trek from Pheriche to Namche (3,440 m): 6-7 HoursToday, after breakfast, we will trek following the Imja River all the way down to Tengboche. On the way, we will go through small villages, pine & rhododendron forests, and small streams. From Tengboche, we will descend down to Phungki Thanka and pass by Kyung Juma before reaching Namche Bazar. Throughout the trial, we will get to enjoy lovely view of the Himalayan landscape. Day 11Trek from Namche to Phakding and then to Lukla (2,800 m): 5-6 HoursAfter having breakfast, we will trek back to Lukla via Phakding. We pretty much follow the same trail. We will begin our trek descending down steeply and cross a suspension bridge. On the way, we will come across several chortens, mani walls, small gompas, and colorful prayer flags. Further, we will ascend through dense forest of pine & rhododendron and reach Lukla our last destination for the day. Day 12Flight back to KathmanduWe will wake up and have our last breakfast with the view of Himalayas. After that, we will fly back to Kathmandu. The flight will be short and offers scenic views of Himalayan mountains. Upon reaching Kathmandu, we will move to our hotel. The rest of the day is free for us to relax and explore around on our own.